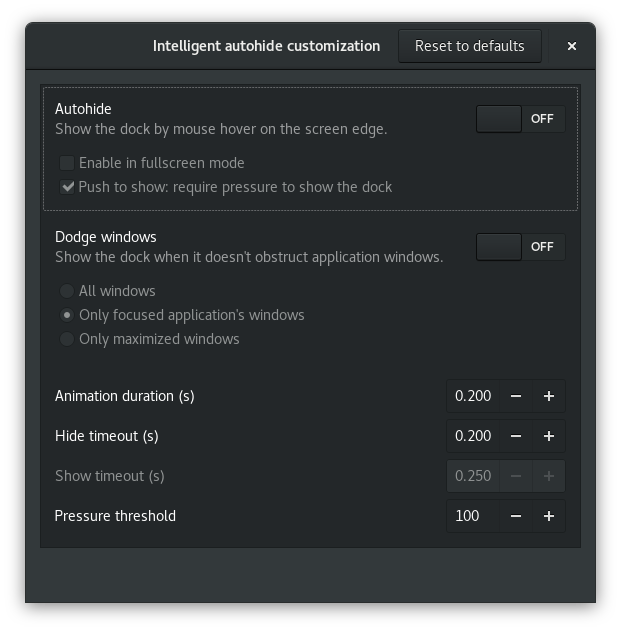 Enable the Intelligent autohide option under the Position and size tab. Click on the "Gear" (⚙) icon next to the On/Off switch of the Intelligent autohide option for more settings. In the new dialog window, disable both options, Autohide and Dodge Windows. Disabling autohide will keep the dock hidden even if you try to move your mouse to where the dock is. 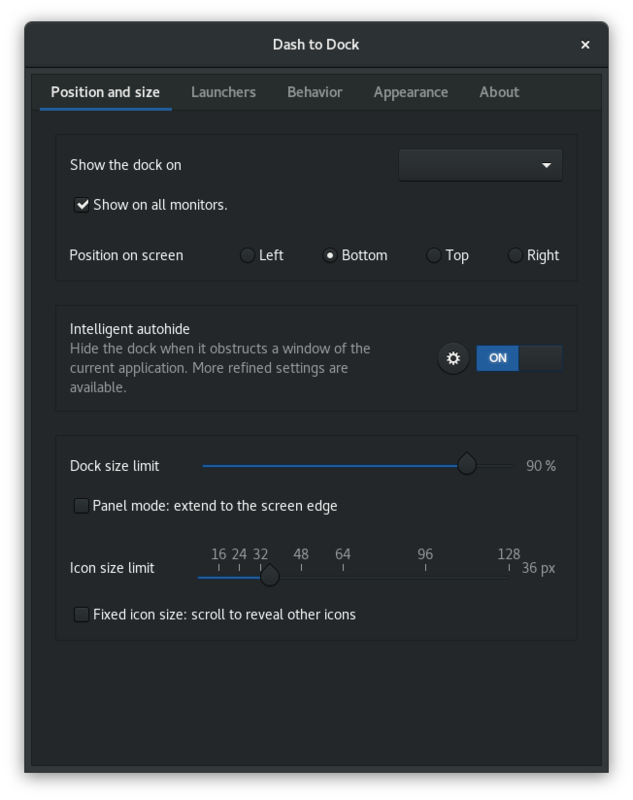 Disabling Dodge windows will keep the dock hidden even when it is not obstructed by any window. As mentioned previously, this will not uninstall or disable the dock. But it will completely hide it. So it will not show on screen again unless at least one of the two previous options is enabled again. This will remove the Ubuntu dock. You will need to restart your GNOME session, you can do this by logging out and back in. You also could do it with dconf Editor which is pretty useful tool if you like tweaking your desktop. And you have you dock visible only in overlay mode (the same as with extension recommended by @Dan). The best method to do this in Ubuntu 18.04 is by using gsettings. Why install extensions when there is a clean way of doing this? Note: Most of the tweaks that you want to do with your UI can be done using gsettings. Use man gsettings and explore more. Not the answer you're looking for? Browse other questions tagged gnome-shell dock or ask your own question. How do I get a vanilla GNOME after Ubuntu 17.04? How can I hide the background applications menu in GNOME? Why can't some applications be locked to the GNOME Dock? Using GNOME Paper theme: how do I make my dock appear when hovering on the left side of my screen? How to hide/show dock in Ubuntu 17.10/18.04 with keyboard shortcut?